My son drew this one day on my Kindle. 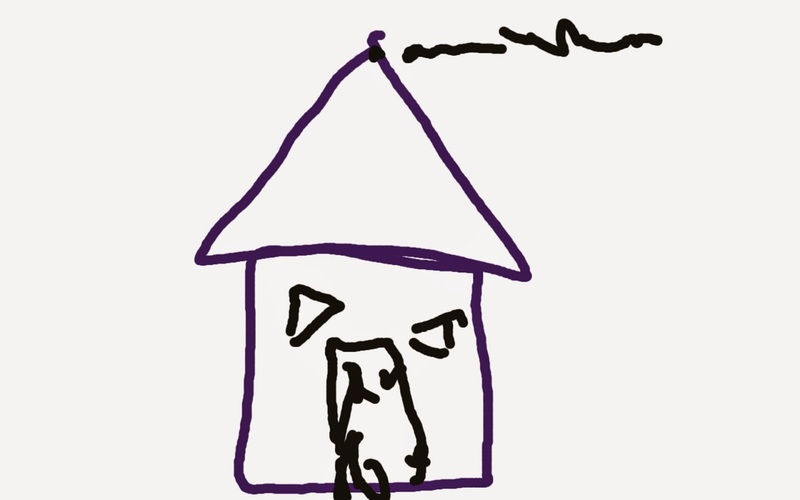 I wanted to see what he would do, so I asked him to draw a house for me. The application isn't one that adds color, but that's all right. I've looked at it quite a bit. At first glance, I thought that my son had drawn an angry house, bellowing at me. Then I thought that he was drawing a jack o'lantern, since the windows were triangular. Still later, it seemed that there was a person standing in front of the door to the angry house, and this person appeared to either be knocking at the door or about to enter. After that, I got a migraine from thinking too hard. I've been trained to look at drawings like these, to search them for any signs of emotional upheaval they may contain. It would be easy to draw conclusions here. It would be easy to say that my son was angry when he drew this picture. This is why I was also taught to never use a single piece of evidence; it's the picture as a whole that shows the child within, not one tiny picture. My child, at least at this time, is relatively happy and healthy, and not in the least bit angry. We tend to make assumptions about other people based on OUR interpretations of what we see and hear. We do this thoughtlessly, and these assumptions are often completely off the mark. I guess that it makes us feel better about ourselves to do so. While we're making assumptions about others, they are making assumptions about us. I need to remember that saying about glass houses and throwing stones. I also need to remember that sometimes a badly drawn house is just a badly drawn house. My son's pictures were often analyzed. All too often they revealed nothing about what was really going on. Interestingly enough though, he always drew me as the biggest person. Ah, I do this too much! Not long ago, I asked my kid, "Why did you use so much black and red in this picture? Do you like... fire?" and he answered "No, the blue crayon was broken." Oh. Ok then. Sometimes a cigar is just a cigar, I guess. For as much an I tend to overanalyze everything, I am not sure I remember doing it with my kids' artwork....the one time it might have been useful. I wonder if I can gt them to draw something today!